Updated: One of the Hidden Flag activists was detained trying to leave Russia. Russia is currently hosting the 21st World Cup. But as we all know, Russia also prohibits any public display of “gay propaganda” and has ignored a violent anti-gay purge in Chechnya (a Russian semi-autonomous region) with more than a year of continuous reports of kidnapping, torture and murder. Thankfully, groups like The Hidden Flag are fighting back. While Russia and Chechnya have denied the existence of an anti-gay purge, stories of Chechen refugees have come to light showing the horrific reality. 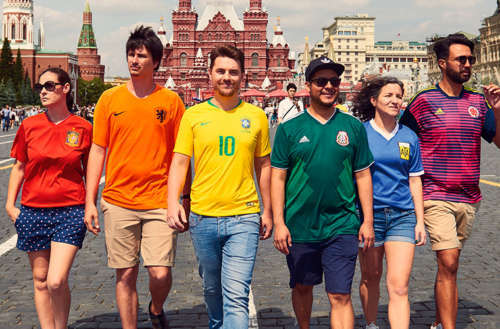 To call attention this travesty, the Spanish association, the State Federation of Lesbians, Gays, Trans and Bisexuals (FELGTB) launched an initiative called “The Hidden Flag.” Six activists from six different countries form a rainbow flag from the World Cup jerseys from each country. 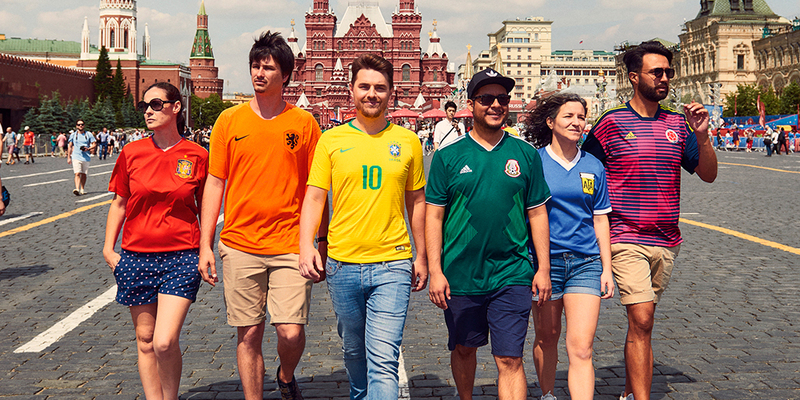 The activists wore the team jerseys from Spain, Holland, Brazil, Mexico, Argentina and Colombia to famous Russian sites, forming a human Pride flag. “Being visible is always a risk. But appearing in front of thousands of World Cup fans and the press motivated us to carry out our protest,” said Uge Sangil, President of the FELGTB. Part of the purpose behind the #HiddenFlag campaign is to be visible for those in Russia who can’t be due to safety concerns. It’s a strong message fo support from those of us in countries that have made progress on that front. It’s almost like a secret message to our Russian LGBT brothers and sisters, letting them know we’re on their side. Update 7/10: The Colombian member of the Hidden Flag, Mateo Fernandez was detained by Russian authorities for 15 hours when he tried to go home. According to Gay Star News, Fernandez wasn’t told why he was being detained. He said he thinks it could either be because he’s Colombian or because they found out about the Hidden Flag protest. He was released at 5 a.m. on Monday, and flew to Amsterdam for a previous work commitment. Find out more about The Hidden Flag here.